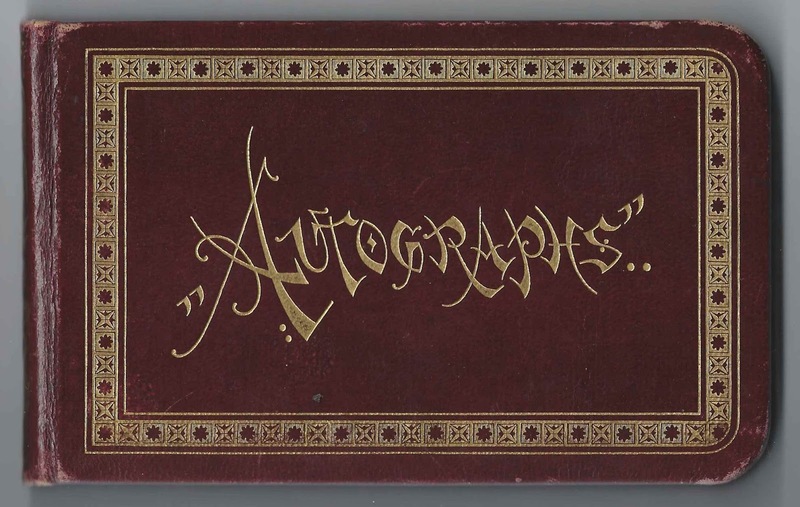 1880s autograph album of Anna, who may have lived at Byron, Maine, and was a student at Farmington State Normal School in the late 1880s. The album is approximately 6-1/4" x 4" and contains the sentiments of 21 of Anna's relatives, friends, teacher and schoolmates. An alphabetical list of the signers appears at the end of this post. 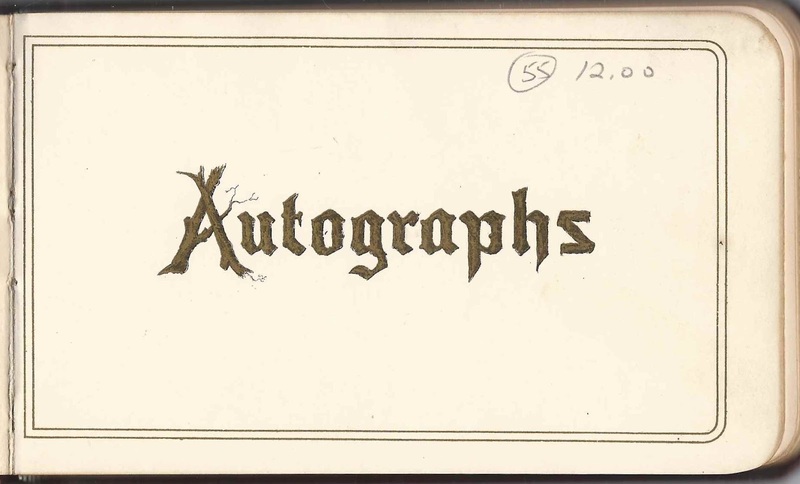 The first signed page in the album was that of Anna's cousin Nettie, who did not give her surname. She signed her page at Byron, Maine, on 15 August 1884. 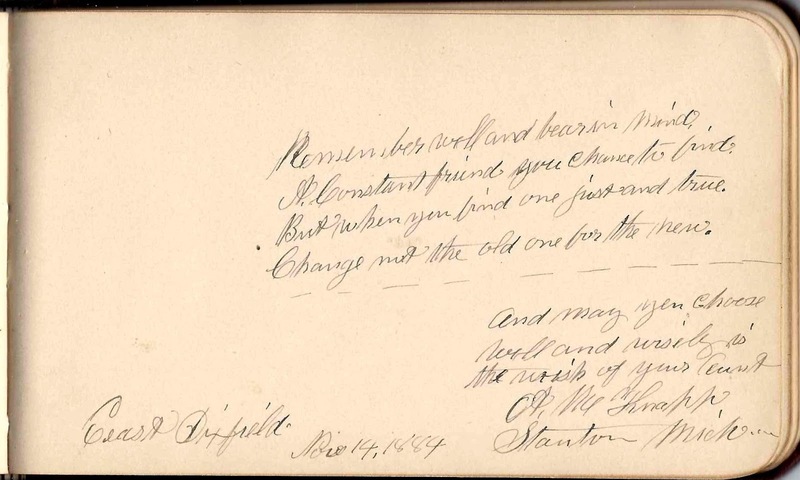 [Note: as shown in the reader's comment below, cousin Nettie was presumably Nettie Knapp, daughter of Samuel and Louisa (Young) Knapp and sister of signer Eva L. Knapp. 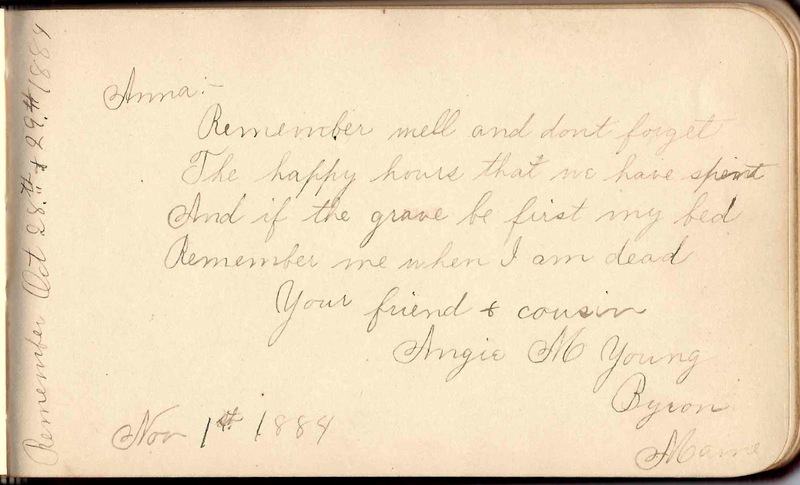 Another signer who called herself Anna's cousin was Angie M. Young of Byron, Maine, who signed a page on 1 November 1884. She was the daughter of Addison Sewell Young and Sarah Jane (Shaw) Young. Her mother Sarah Jane (Shaw) Young was a sister of Anna's mother Phebe (Shaw) Knapp. Angie's father Addison Sewall Young was the younger brother of Louisa (Young) Knapp, mother of signers Nettie Knapp and Eva L. Knapp. Another relative was Anna's aunt A. M. Knapp of Stanton, Michigan, who signed a page at East Dixfield, Maine, on 14 November 1884. 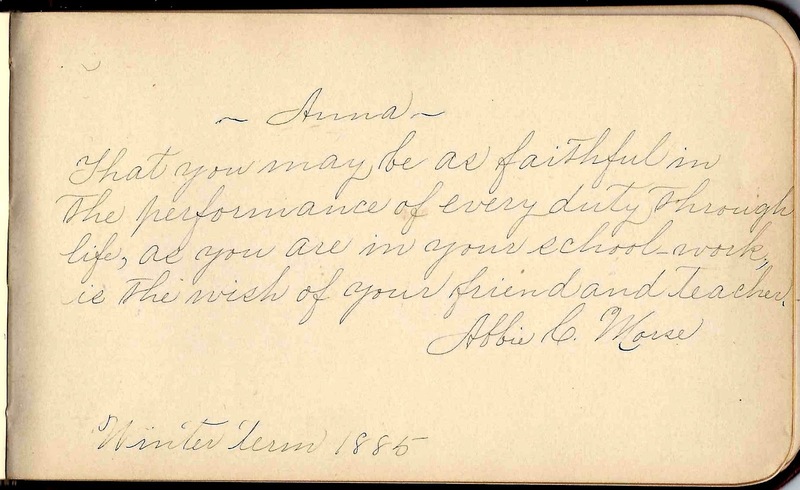 Anna's teacher Abbie C. Morse signed a page during the Winter Term of 1885. Two signers from Georgetown, Maine, who signed adjoining pages in 1889, were Anna's schoolmates at Farmington State Normal School. They were Ida B. Oliver and Josie H. Steadman. If you have a theory as to the identity of album owner Anna, or information on any of the signers listed below, please leave a comment or contact me directly. Thanks! Nettie, cousin of the album owner, signed at Byron, Maine, on 15 August 1884. "We for a time have been together, We must part perhaps forever, But if we must parted be, Grant my last wish, remember me. Your Cousin, Nettie." 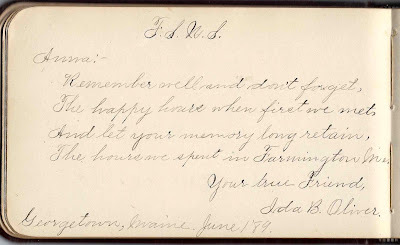 "Remember the night we laughed, Aug. 10th" "Apple-sauce"
Livea Adams of Dixfield, Maine, signed on 25 January 1885 " 'Fruit decayeth as soon as ripened, Love and kisses soon grow cold, Young men make their vows to break them. Look, out, Annie, don't get sold.' "
Lizzie M. Adams of East Dixfield, Maine, signed on 9 February 1885 "Is it in vain in life's wide sea To ask you to remember me? Undoubtedly it is my lot to Be just known and then forgot." In the top corners: "Schoolmate" and "History"
Spurg Butterfield, signed 15 January 1889 Presumably Spurgeon Butterfield. "Wisdom is the principal thing; therefore get wisdom and with all thy getting get understanding. Yours truly." "Prov. 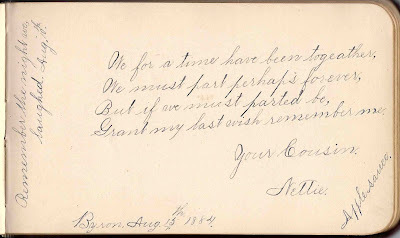 4-7"
Alice B. Cox of East Dixfield, Maine, signed on 23 January 1885. "Like the myrtle, facing never, Happiness be thine forever. A Friend" "and will thou turn from the wild joys of thy youth from the mad pleasures etc." 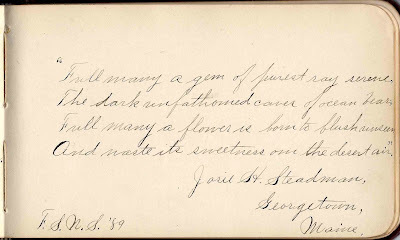 Gertrude M. Eastman, signed at Auburn, Maine, on 13 April 1891 "May you always be happy And live at your ease With a great big husband To kiss when you please." Myra Fletcher of East Dixfield, Maine, signed on 10 October 1884 "Put on the air of a light keyed flute If you are only a penny whistle. Pass yourself off as a garden rose If you are only a wayside thistle." 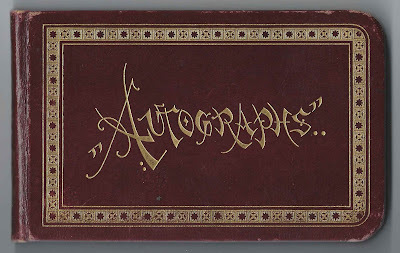 H. Ford of Mercer, Maine, signed on 1 November 1884 "Annie, I take my pen into my hand And grasp your Album right And for my life I cannot think One single thing to write." Anne J. Hiscock of East Dixfield, Maine, signed on 30 January 1885 "When on this page you chance to look, Just think of me and close the book." 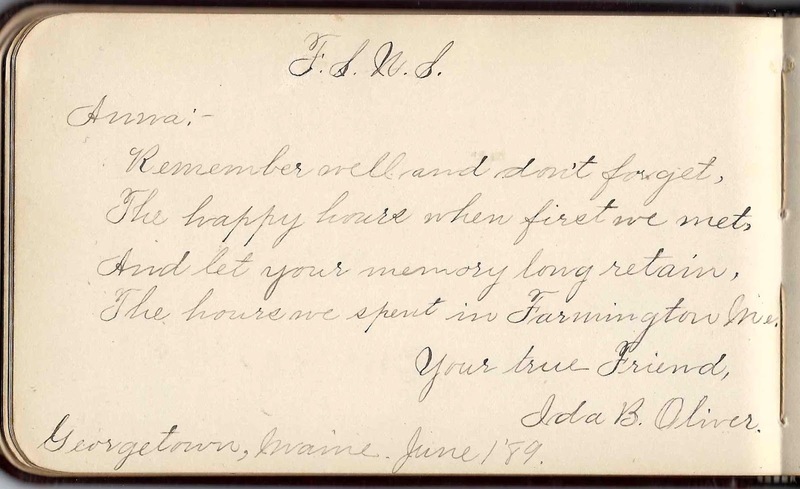 Eva L. Knapp of Byron, Maine, signed on 8 August 1884 "Anna, Preserve these simple lines, If ever you read any. And think of me Among the many." "Treats"
A. M. Knapp of Stanton, Michigan, signed at East Dixfield, Maine, on 14 November 1884; Annie's aunt "Remember well and bear in mind, A constant friend you chance to find. But when you find one just and true, Change not the old one for the new. And may you choose well and wisely is the wish of your Aunt." Abbie C. Morse; Anna's teacher. 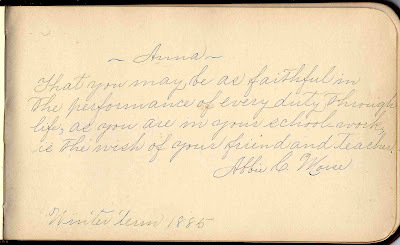 "Winter term 1885" "Anna, That you may be as faithful in The performance of every duty Through life, as you are in your school-work, is the wish of your friend and Teacher, Abbie C. Morse"
Ida B. Oliver, signed at Georgetown, Maine, on 1 June 1889 "F.S.N.S. ", presumably Farmington State Normal School "Anna: - Remember well and don't forget, The happy hours when first we met, And let your memory long retain, The hours we spent in Farmington, Maine. Edwin N. Palmer, signed at Auburn, Maine, on 14 August 1891 "My pen is poor, My ink is pale, And my hand trembles Like a little dog's tail. Your friend"
Amy M. Reed, signed at Byron, Maine, on 21 November 1886. "Kiss is a noun both common and proper, not very singular and agrees with you and me. 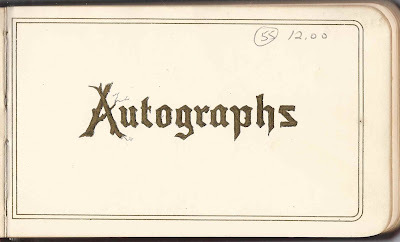 Sincerely Yours" "Patridge"
Josie H. Steadman of Georgetown, Maine, signed at F.S.N.S. in 1889, (Farmington State Normal School). "Full many a gem of purest ray serene, The dark unfathomed caves of ocean bear; Full many a flower is born to blush unseen And waste its sweetness on the desert air." Emily J. Taylor, signed at Byron, Maine, on 5 August 1884 "Modesty is one of the chief ornaments of youth." Angie M. Young of Byron, Maine, signed on 1 November 1884; Anna's cousin "Anna: - Remember well and don't forget the happy hours that we have spent, And if the grave be first my bed, Remember me when I am dead. Your friend and cousin." "Remember Oct. 28 & 29th 1884"
It's unfortunate that the History of the State Normal School lists only the graduates through 1889. I would guess that Nettie and Eva L. Knapp were sisters, daughter of Samuel and Louisa (Young) Knapp of Byron. They had a cousin, Anna I. Knapp, who was born in Byron in 1869, the daughter of William A. and Phebe (Shaw) Knapp. She was a teacher when she married Norman D. Marsh in 1902. Thanks, I think you've identified the owner Anna! I'm amending the post to direct readers to your comment. Chris, the 1870 Census of Byron has a William A. Knapp and daughter Anna I. Knapp with mother Eva S. (Shaw??). Could Eva have been another of Phebe's given names? It doesn't sound as though Eva was a previous wife, as William and Phebe had been married since 1856. Taconnett Falls Genealogy Library has a copy of UMF grad Cheryl P.'s wonderful project of assembling the responses of a round robin sent to FSNS grads sometime in that era; their responses of what they'd been up to since graduation are enlightening/endearing/bittersweet/melancholy. Next time I go, I'll search for Anna's name and those of the other signers, just in case. He was married to "Phebe" in 1860 and 1880, so I assume that "Eva" was an error.